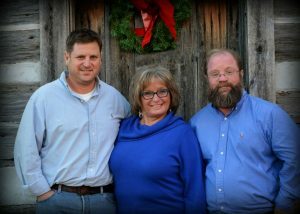 “My name is Vicki Wilson and I was first and foremost a parent of two Head Start children located in Leitchfield, KY; one of which was born with a cleft lip and palate, minimal CP and eye problems. My family was low socioeconomic but we were hard working and wanted our children to have early education; namely, one that serviced disabilities. My younger child, one with birth defects, attended two years prior to entering the public schools for kindergarten. 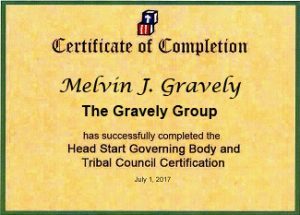 “I remember vividly how inviting the Breckinridge-Grayson Program (BGP) employees were and how welcoming all the employees were. The level of care and concern was given was amazing. The bus driver, Gerene Keresy, was so good with my boys and they could hardly wait for her to come the next day. The teachers, Gayle Parker, Carolyn Downs, Billie Jean Williams and Mary Williams were terrific. Ms. Parker still works part time at BGP. “It was at BGP that I was inspired by the speech therapist, Helen Shull/LEA, who worked diligently so that my son could speak clearly and be understood by peers and adults. He even spoke with no nasality. I recall how the speech therapist modeled speech sounds and how she utilized this little green mirror my son used to help with the modeling of sounds. While he could be very busy, determined and stubborn at times, the speech teacher and the staff worked with him to do what was expected and modeled the expectations. “Another memory is how that my boys were self sufficient with meal time and how that carried over to home. In October of this year, my son will be 44 and has endured 35 surgeries. His early start at BGP was very instrumental in his successes. BGP taught me how to be an advocate and was very instrumental in shaping my future. “I went to college and earned a BS Degree in Elementary Education, a Masters in Arts in Elementary Education with a Reading Endorsement and a Rank I in Educational Leadership, Elementary Counselor Endorsement, Secondary Guidance Certificate and K-12 Individual Intellectual Testing Endorsement (IIA). I worked in the public schools for 31 years; 16 years in the elementary education as a teacher; and the last 17 years, I worked out of central office as the evaluation specialist/consultant. 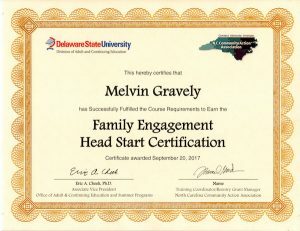 Three years ago, I retired from the school system and during that time, I worked with preschool and head start and other agencies with screenings, observations, assessments, chairing meetings, interpreting results; just to name a few. As a result of those experiences, when I retired three years ago, I was employed by BGP as the Disability/Mental Health Specialist, my dream job. Again, BGP prepared me early on for the current position. My passion is working with children, teachers, families, other agencies and the LEA to advocate children in general; namely, those with disabilities. It gives me great please to give back to BGP while doing what I enjoy.